“It’s not a race, it’s a challenge” said Ben as he delivered the race briefing to the numerous bleary eyed runners gathered inside Weymouth and Portland Sailing Academy. 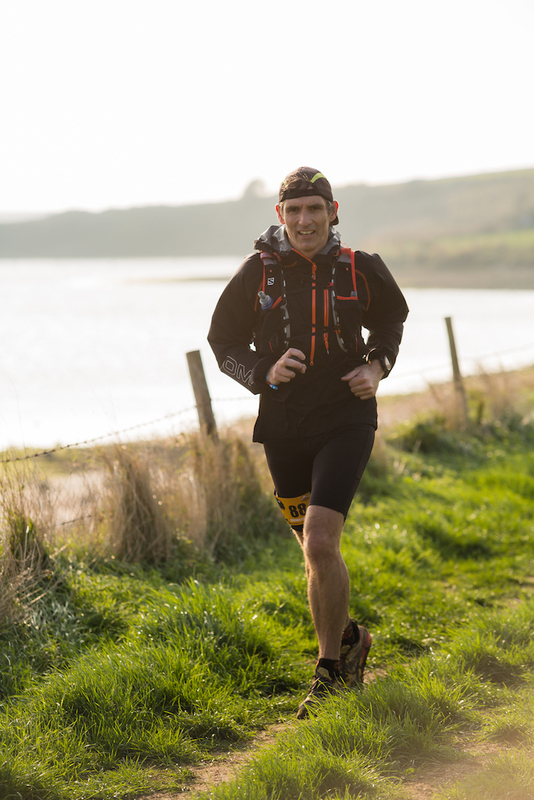 Ben is part of VOTWO Events who, for over 10 years now, have organised the Jurassic Coast Challenge. 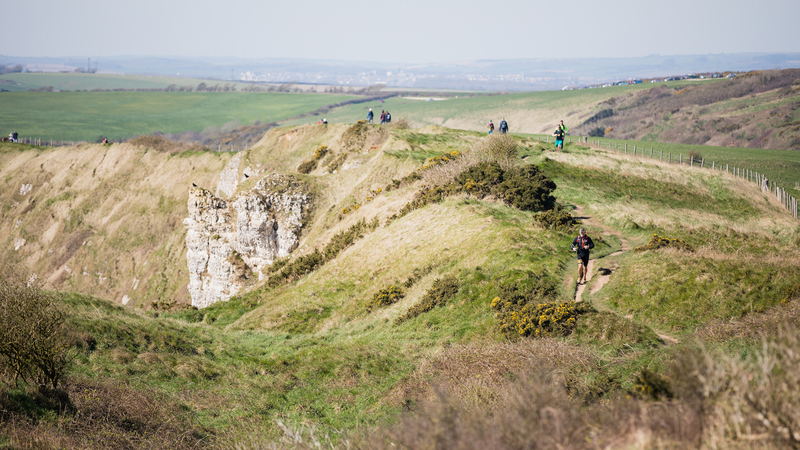 Three marathons over three days along the stunning Dorset coastline, famous for its dinosaur bones and the crime drama that is Broadchurch. I stood to the side with my GoPro, trying to appear as inconspicuous as possible. I have done a few interesting, exciting and tough events over the years, but I had never entered a multi-day race until now. I think that may be part of what keeps me motivated. Attempting things I’ve never attempted before. Going beyond and having no clue how it will feel or whether I will succeed. A challenge should definitely be something you are unsure whether you can complete. The Jurassic Coast Challenge is a well-oiled machine. VOTWO Events provide accommodation, should you need it. There are meals in the morning and evening and plenty of transport to take you to and from start and finish points over the three days. The event is touted as ‘self-navigation’, but at registration you are supplied with colour printed maps detailing the route. There is mandatory kit which includes waterproof clothing, torch, compass and space blanket. You’re even required to carry a waterproof notepad and pencil, which is something I have never come across before. Suffice to say this is not a challenge you can take lightly. You can’t just rock up in your club vest and go. The South West Coast Path is notoriously dangerous, even on this relatively mild stretch through Dorset. One year the weather was so bad, the entire race was stopped midway by the coastguard. Thankfully however, this year the weather looked to be particularly good. There was a rumour we may even see the sun. None of us believed it. Participants are divided into two groups. Slow runners and walkers start in Group 1. Faster runners go in Group 2. I’m not particularly fast but I was put in Group 2. This meant that day one became a very long day. With registration at 8:30, race briefing at 10am and then an hour coach journey to the start, I didn’t actually get running until well after midday. There is no official start time for the Jurassic Coast Challenge. Effectively, you get off the bus and go. I took a little time to sort out my watch and camera equipment and by the time I was ready almost everyone else had gone. I started with the back-marker and one other chap. Day one starts near the village of Charmouth and the route heads east. The marathon finishes back at the Sailing Academy HQ on the edge of Portland. It was grey and damp as we immediately hit some pretty brutal elevation. However, this was offset by the beauty of the trail. You could not help but stop to catch your breath half way up a hill, and take in the scenery. Checkpoint One was right in the heart of Broadchurch country. West Bay is the location for much of the filming in the popular TV series and, being a fan, I had a little look at the police station and the cafe before heading up another huge incline on the other side of the beach. 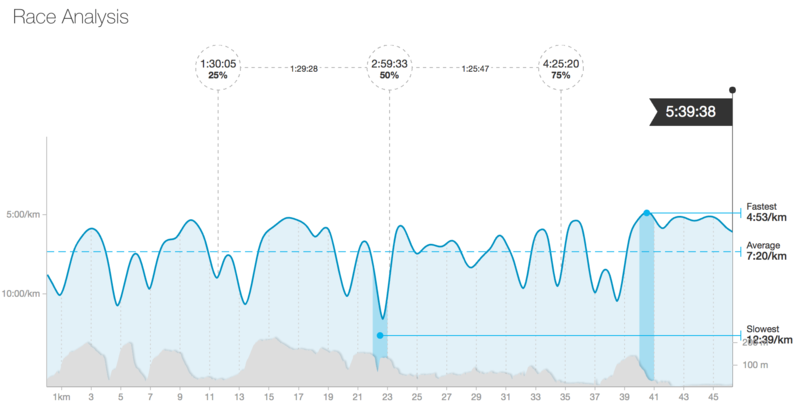 Despite the early elevation, marathon one actually has the least amount of climbing over the three days. This became all too apparent as we passed Abbotsbury and the hills gave way to vast quantities of mud and the shingle on various beaches. By now the clouds had cleared and Chesil Beach was resplendent, shimmering in the late afternoon sun to our right. I was tiring though. The mud was sapping the energy in my legs far more than the hills had done. Eventually I reached Ferrybridge and a sign which read, ‘400 metres to go….ish’. At first I didn’t take much notice of the ‘ish’. However, as I ran, 400 metres came and went, and turned into 800 metres and then 1 kilometre. By the time I had run 2km on from the sign I realised I’d been had. I could see race HQ up ahead and it didn’t seem to be getting any nearer. When I did eventually reach the Sailing Academy building, the final kick in the teeth was to be directed all the way round the back! When I finally stopped my watch I had done just under 45 kilometres. It took me some time to compose myself before I could get some fluids back in my body, shower the mud off my legs and drive back to my accommodation in Dorchester. I definitely questioned how I would be able to run another marathon the following day. But there was no getting away from it. Day two duly arrived and I dragged myself up early. I had heard that it would be ok to start in Group One, so I decided to get going. The procedure is essentially the same as day one. You still need to register at HQ, collect your bib number, go through kit check and listen to the race briefing. Then it’s out to the busses. The journey was much, much shorter today. Literally half a mile along Portland Beach Road we alighted the transport and set off on another marathon adventure. The first two kilometres are flat along the road to Portland. Portland is a limestone tied island and is the southernmost point of Dorset. It is famous for its stone which has been used to build St. Paul’s Cathedral, Buckingham Palace and the UN Headquarters in New York. Our route took us on a full circumnavigation of the island. We ran frighteningly close to the cliff edge on the outward journey and reached checkpoint one at the lighthouse before turning into a very strong wind to head back via abandoned quarries and the old HM Prison The Verne. Originally built on the site of a 19th century military citadel, the prison was closed in 2013. Having covered 18 kilometres, I arrived back at race HQ, which was now doubling as Checkpoint Two. It was a glorious day. The sun was really bright and the run around Portland had been stunning despite the wind. We now set out on a long stretch of flat running taking us all the way in to Weymouth, around the harbour, and all the way along the seafront promenade. 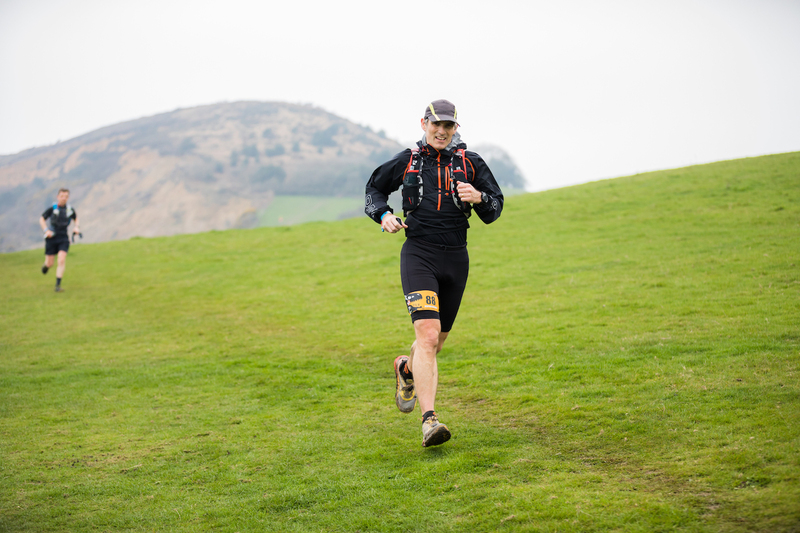 It’s always difficult in marathons or ultras with long sections where the route is flat. It’s so tempting to walk but you have to keep going. You have to focus your mind on the job or alternatively, take your mind off the job. I tend to do a bit of both. I concentrate on putting one foot in front of the other, but I take my mind off the desire to walk by enjoying the scenery. I ran along The Rodwell Trail, on the old Weymouth to Portland railway line, then through Nothe Gardens and down to the harbour. It was then a straight run right along Weymouth seafront to Bowleaze Cove and the mouth of the River Jordan. 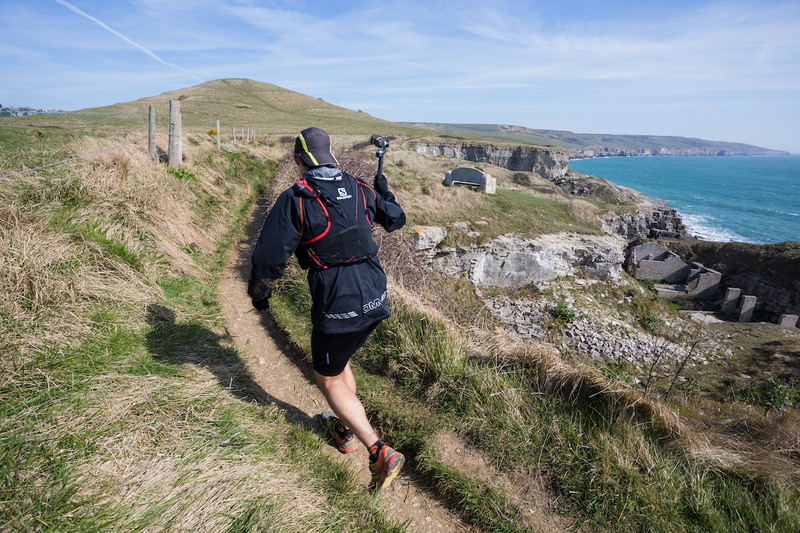 At around 30 kilometres into day two we ventured back on to the hills and on to Checkpoint Three at Osmington Mills. A few people stopped at the Smugglers Inn pub for a drink before tackling the final 10km to the finish at Lulworth Cove. Wow. If you have never run this section of the South West Coast Path before, you are in for a real treat. It’s not easy, there are some monster hills, but this is arguably some of the most beautiful running in England. The coastline is superb and reaching Durdle Door with a few kilometres to go is amazing. It is a natural limestone arch which attracts thousands of tourists. Interestingly, although it is open to the public, it is privately owned, as part of the Lulworth Estate. The final run down the hill to Lulworth Cove is also fantastic. I simply could not resist a quick dunk in the icy cold water at the end of another 44km marathon. Many others tucked into soup as they sat on the grass in the warm sun waiting for the next mini-bus back to HQ. My legs had actually survived, and survived quite well. Despite the extra elevation, I think I found this marathon easier than day one. More enjoyable certainly, with the weather and the views. If you ever get the chance, you have to run this section of coastline. I would argue that it is a must for any UK based trail runner. The final day reared its head an hour earlier than it had any right to do, due to some anomaly with the clocks and British Summertime. It was still dark when I got in the car. Back at Lulworth Cove a couple of hours later, it was cool but the sun was out again and I couldn’t wait to get started. There is a big climb out of Lulworth initially, but then you’re right on the top of the cliffs with amazing views. What follows are ups and downs like you have never seen. In all honesty, the descents are terrifying! There are some incredibly steep downhills and an equally breath-taking number of climbs before some flat running on the cliff edge. Down in the valley to the left we passed the village of Tyneham, abandoned in the 1940s to make way for a military training area. You can still visit the old school and church at the weekends when the army aren’t rampaging through in their tanks. This whole area is still under military control and there are signs everywhere telling you to stay on the path and that there may be unexploded bombs nearby. I was very happy to stay on the path and it is more than a little disconcerting when you do occasionally take a wrong turn and find yourself crawling through brambles. After the first checkpoint at Kimmeridge we headed inland to the village of Kingston and then back out to the coast. There are a few diversions on the coastal path and I certainly wasn’t the only one to have to stop and analyse the map or the line on my watch to work out where I was supposed to be. This was by far the most challenging navigational section of the whole three days. I nearly came a cropper on more than one barbed wire fence I can tell you. It’s a shame that this diversion meant we couldn’t see the wonderful cliffs at Swyre Head. If you’ve done the Purbeck Marathon you’ll know what I mean. You can watch this 360 video which includes a little tour of Tyneham. I don’t really know why the Jurassic Coastal Challenge misses this bit out. That said, you can look back once you get to the coast path again and it’s still a fantastic view west. Now, let’s talk about steps. Just before Checkpoint Two, there are two sets of steps. One going down into a valley and the other coming back up. Unless you have climbed to a Tibetan monastery, I can pretty much guarant ee you have never seen steps like it. They are without doubt the longest, steepest steps I have ever had the misfortune to encounter. If you want a quad-crushing, lung-busting, trip-inducing, ‘all hope is gone’, ‘Lord, take me now’ moment in a marathon; this is it. Never, ever again. Well, maybe next year. Checkpoint Two is high on the cliffs at St. Aldhelm’s Chapel and near St. Alban’s Head coastguard look out, then it’s a straight run on the coast path right on the edge of the cliffs to Checkpoint Three at Swanage. 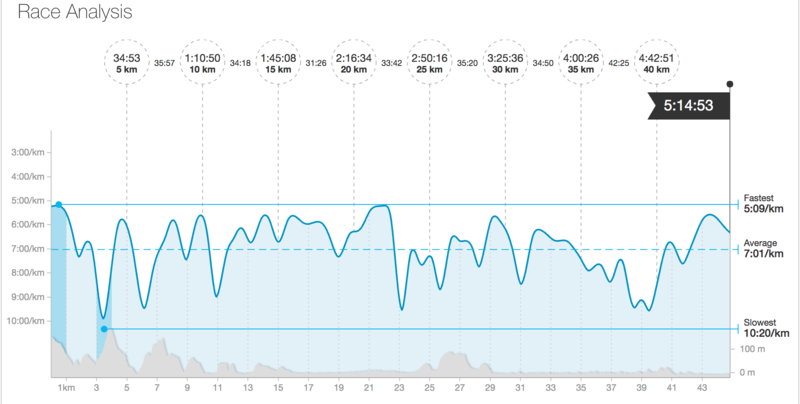 My legs were holding up well and I managed to keep a steady run going most of the way. In truth, I was being dragged along by the chap in front. I thought, if I could keep him in sight I’d be doing well. As it was, after another moment of navigational confusion, we arrived at the final checkpoint together. David introduced himself, and we continued together along the entire seafront at Swanage. It’s just a battle of mind over body, or vice versa, at this stage. There was yet more confusion at the far end of the promenade when we couldn’t see a way back up on to the cliffs. After 5 minutes of searching with a third runner who had caught us up, we found the steps and climbed the final hill. This led to a headland overlooking Swanage Bay to the west and Studland to the east. 6km from home is where things went slightly wrong. The two chaps I had been running with headed off to the tip of the headland. In the days prior to the event, I had downloaded three gpx files from the VOTWO website and loaded them on to my Fenix 3 running watch. I had, wrongly as it turns out, assumed they contained absolutely the correct route and I had therefore decided to trust my watch with the navigation and leave the printed maps in my back pack. So when I saw two said chaps running off to the headland, I looked at my watch and saw it telling me to go in entirely the opposite direction. They were too far away to shout. They were going the wrong way. I was sure they would figure it out and get themselves back on the right track. I fully expected to see them behind me as I started down the hill to the beach. By the time I hit the beach my watch was already reading 42km. I kept running on the soft sand along Studland Beach. I was still running 3km later, when I came across a photographer who snapped a few shots as I passed. I rounded the beach to Shell Bay and finally saw a VOTWO flag. I made my way over the beach to the sand dunes, crossed a wooden bridge and finished marathon three of the Jurassic Coast Challenge after 5 hours 39 minutes and over 46 kilometres of running. Strangely, I found that I was the first runner to finish. Obviously, the faster runners had mostly started in Group 2 a little later. I had wanted to get it over and done with so had started with Group 1, but I had not expected to be first back. Not long afterwards the two chaps who had run off to the headland arrived and were more than a little miffed that I had cut off the headland. “What??? But I followed the gpx file on my watch!” said I. It turns out that the route has changed since the file I used was produced in 2014. The route did indeed cut off the headland in the past, but now it is included in the course. Ooops. I do feel a little guilty that I didn’t do the prescribed route. But I’m also perturbed that I didn’t at least have a look at the printed map to double check whether I was right and also that the correct gpx file wasn’t on the website in the first place. That said, I have nothing but praise for VOTWO Events for their logistical management. The organisation was second to none and the routes were all superb. Despite my error near the end, I still ran 46 kilometres and that is way more than a marathon, so I hold my head up with enormous pride at completing the beautiful, testing and majestic Jurassic Coast Challenge. 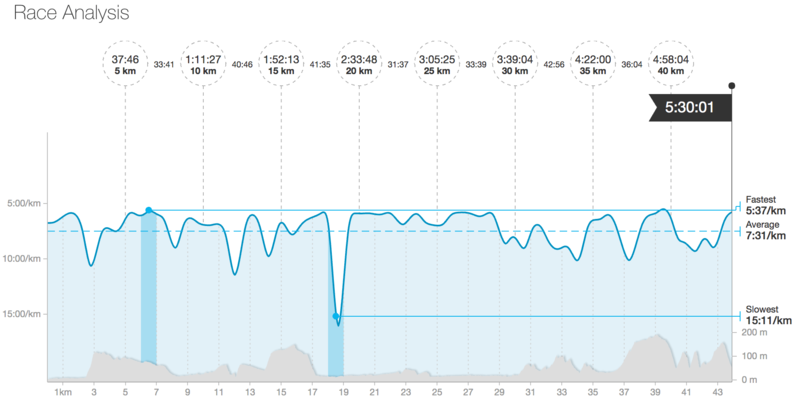 For those interested, you can see my Strava activity pages for each day here. 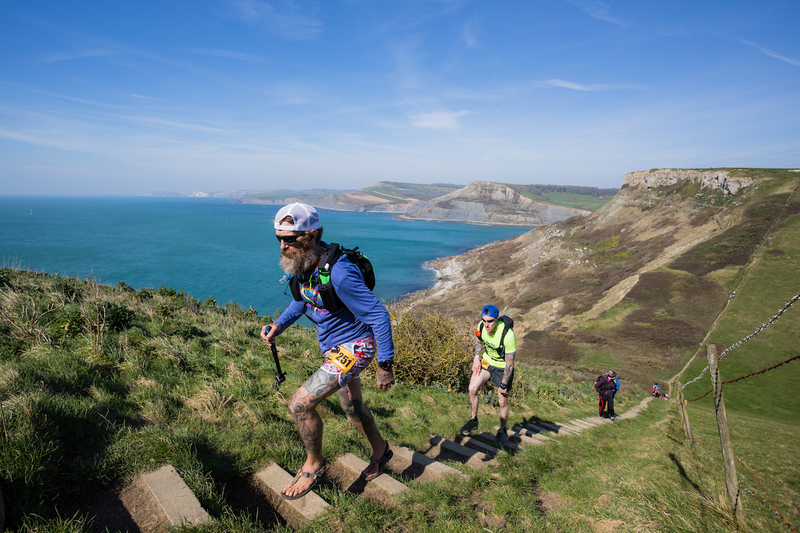 If you have enjoyed this Jurassic Coast Challenge race report and video then please do share it with friends and give it a ‘like’. All images courtesy of Christiaan at the excellent No Limits Photography.